We lovingly accept orphaned or abandoned little furry friends who need medical attention ranging from simple antibiotics to possible surgery. At that point, they are given all the TLC we have to help nurse them back to health. For some animals, this is the first time they have ever seen a doctor to receive the medical assistance they need. We do this because we love them and they deserve a chance to live out a long happy and healthy life. We will not release any animals for adoption until we are sure they are in the pink of health! For more information about adopting one of these little guys, please call Kimberly at 510-912-9036. George, our beautiful Cocker Spaniel, was initially looking a lot like a dust mop (see picture on left). After a trip to the beauty parlor, George became Gorgeous George! He is sweet natured and a wonderful little guy but sadly, his owners never took care of an eye infection he had. George lost vision in his eye and it was decided he needed to have it removed to avoid any further irritation or infection. On December 21st, George had his surgery. It was more involved than originally expected so George stayed on pain meds and antibiotics longer to keep him comfortable. We are happy to report George is recovering well and is still as sweet and beautiful as ever. 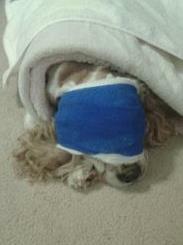 He didn't like his bandages much and kept removing them! To help him stay comfortable, he gets a warm/hot compress and cleaning several times a day by his foster mom. 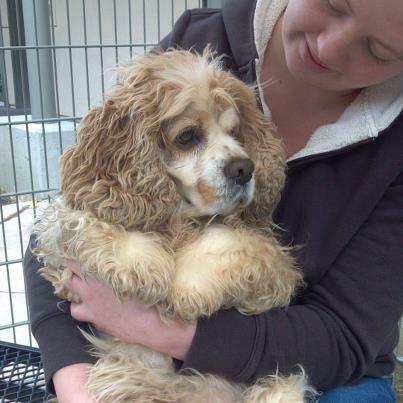 He is loved and we only want sweet George to recover as quickly as possible so he can find his FurEver home! 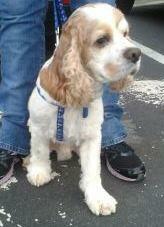 UPDATE 2/9/13: Georgie has a wonderful new family who just loves him the way he is - he is just perfect!! YAY!